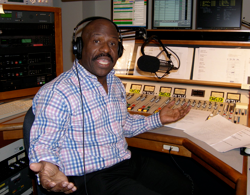 With few options left in talk radio, veteran media personality Jimmy Myers takes over the morning show at Boston's only Black radio station 106.1 The Touch. However "The Touch" is a low powered FM radio station that has less than a 10 mile broadcast range that doesn't reach most of Boston. For it to become a viable radio station, The Touch 106.1 website is probably the best way for the Boston community to listen to the station. The relationship of Boston's radio station and the choice African Americans listeners have for programming is unimaginable. The last African American radio station to serve Boston was the legendary 1090 AM WILD. (Even with its heritage status, WILD listeners were use to the station signing off at sunset every night due to FCC regulations) Radio One, Inc. took over the station in 2000. The station featured the Tom Joyner Morning Show, Al Sharpton talk show in the afternoon, with R&B, Soul, and Gospel music programming on the weekend. They even added a FM station in 2005 as Hot 97.7 which was eventually sold. However after many changes, Radio One chose not to program the station any longer leaving Boston's Black community without one to call its own. Since 2011, Radio One, which still owns the station, now airs programming from Chinese Radio International. FROM THE BOSTON HERALD- Jimmy Myers, who’s been a lightning rod in this town for almost 40 years, is back on the air again, though the only places he’ll be heard are in the inner city and parts of downtown Boston. Housed in a basement studio across from Mosque 11 in Grove Hall, the station is called Touch 106.1, a low-powered FM outlet with a signal that doesn’t span more than a couple of miles. For a stormy personality who’s been heard at stations up and down the dial, this latest venture, on the air from 7-10 each morning, called for a bit of humility. The feeling here is that he’s always done great radio, never needing the low-rent props of risque repartee to sustain a conversation. He was above that because he was better than that, but he was also hotter than a pistol, as he was the night he quit his Channel 4 job on the air. That explosiveness still makes a lot of people nervous, though Jimmy plays no favorites. When WEEI dumped him 10 years ago, he lambasted middle-of-the-roaders. “Maybe I’ll never work in this business again,” he said.